Whether it be in the carnivals of Rio or at your corporate team building event, Samba drumming brings people together. When your delegates join forces as a bateria – the Brazilian word for samba band – they’ll discover a new way of working together, communicating and having fun. Like all great carnivals, our samba drumming sessions build up energy and excitement. An Unbeatable Energy session is the ideal crowd-pleasing opener, mid-point boost, or grand finale to your corporate event. As well as the example session below, we can tailor samba experiences to fit your requirements on request. Just get in touch to talk about your own unique event. Get your whole group working and playing together in our exhilarating samba drum circle. With real Brazilian samba instruments like the surdo and chocalho, delegates create the thrilling sound of samba in your event space. The patterns delegates will learn are simple and accessible. But when they all play together, delegates will hear the powerful, colourful rhythms they have created as a team. It’s a rush you can only experience through group drumming. The instruments you’ll play in your event include authentic, colourful samba drums from Brazil. Samba’s drums and percussion instruments originated in Africa, but they’ve evolved their own style and names in the years since they were first taken to Brazil. Here’s an introduction to some of the instruments you’ll be playing at your corporate samba drumming event. The samba band’s bass drum is the surdo. Wearing the drum around their waist or shoulders, surdo players march through the streets while beating out the driving bass rhythms of carnival. When you feel the deep sound of the surdo resonating through your body, you’ll feel like a true samba player. The tamborim is not a tambourine. It’s actually a small hand-held drum, with a high and sharp sound. You hit it with a whip stick, to make fast cross-rhythms that give samba its unique sound. Expert players flip the drum mid-pattern and delay one note to create a 'shuffly' swing rhythm. How good a tamborim player will you become? Playing the chocalho doesn’t just drive the rhythm of the samba band forward - it will give your arms a workout as well. Chocalho is just the Portuguese word for ’shaker,’ but a samba chocalho like ours has many rows of jingles for a fuller sound. You’ll really feel the carnival spirit once you start shaking! The agogo bells are a bit like a cowbell, but much more fun. You can squeeze the two bells together to make one sound, and hit them with the agogo stick to make another. Then, with a little bit of practice with Unbeatable Energy, you can combine both sounds to make amazing rhythms. The name ‘repinique’ comes from a Portuguese word meaning ‘to call.’ And this metal-shelled drum is certainly loud enough to be heard. A favourite of baterias (samba bands) in the Rio and Sao Paolo carnivals, the high-pitched repinique leads the sound of samba. 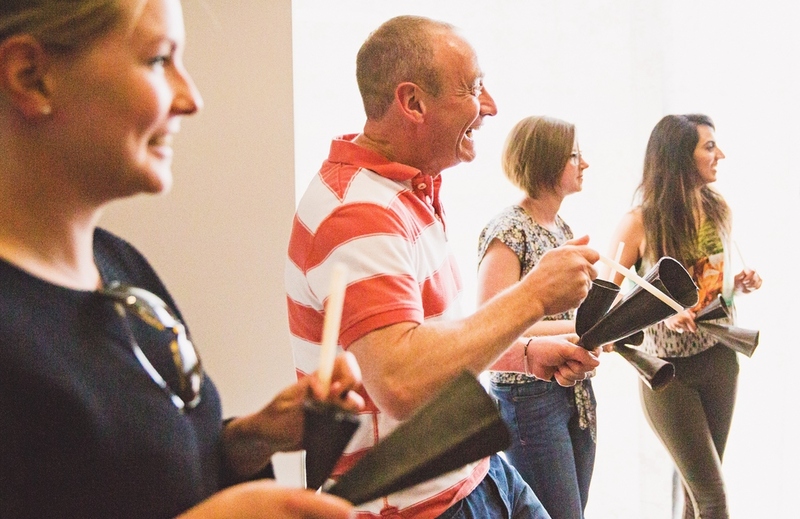 To book, or request more details on how our samba drumming sessions can energise your team or corporate event, click below.